The color can immediately tell you if the oil was at optimal quality and heat. If the ends are burned, it can mean that the oil needs changing or too hot. The perfectly fried food should be golden and a similar hue throughout. From the first bite, you can tell if the food was freshly fried or has been sitting under a heating lamp for an hour. 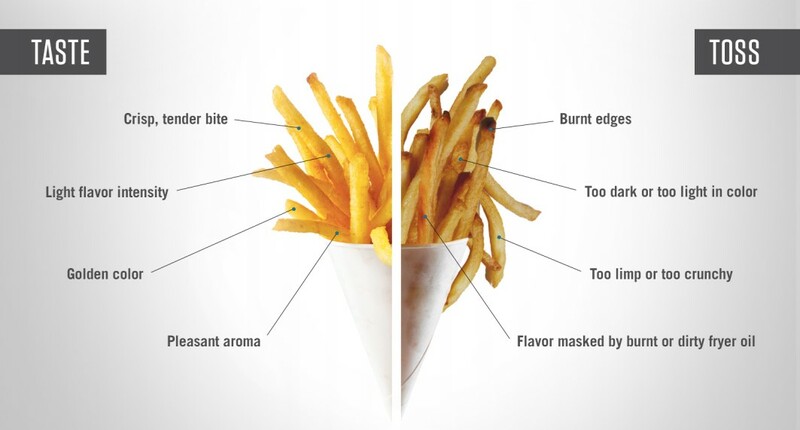 A fryer with optimal oil quality and filtering will produce foods that are crisp, but not too stiff, and with a tender center. When food is being fried at an optimal temperature and in clean oil, the aroma produced is pleasant and smells like the food, not the oil. If the aroma smells burnt or oily, then it is time to change your oil. You do not want to have to throw out food that has been fried poorly in dirty oil. Take the guesswork out of oil management (when to change, when to clean filters and how to properly dispose of it) with Restaurant Technologies’ total oil management system and AutoMist. Both systems are designed to automate the task of keeping your fried foods at their peak quality—and your customers coming back for more.